The box says the Razor Crazy Cart is suitable for ages nine years and up, but there will likely be some older ‘kids’ trying it out when the younger kids aren’t around. 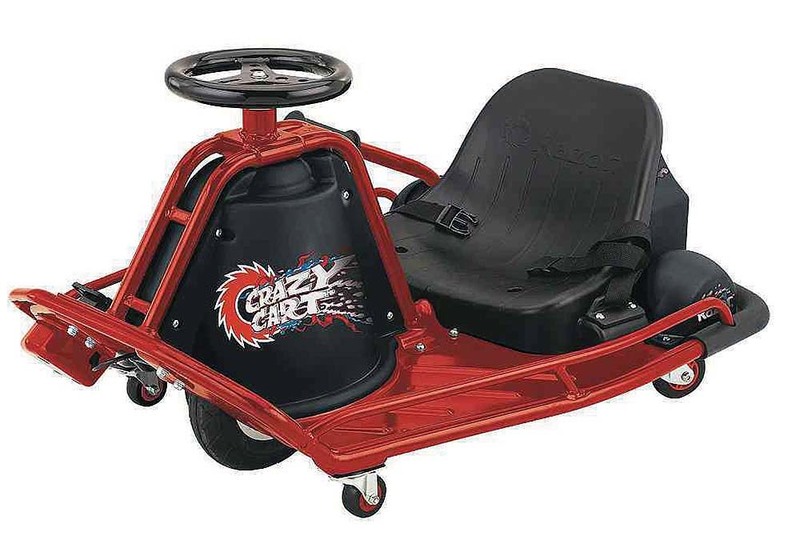 The Crazy Cart is a kind of battery-powered go-kart that allows you to drift (skid) it through a full 360-degree sweep at varying speeds up to 12 mph. It can even be made to spin like a top, if your stomach is up for such antics. The 24-volt battery allows the Crazy Cart to operate for up to 40 minutes before taking a 12-hour time out to recharge. Prices start in the $300 range. Get more info, including where to buy the Razor Crazy Cart, at www.razor.com.